Even experienced hikers forget basic gear. Don't let dehydration, low energy or sunburn turn a lovely day hike into a dud. 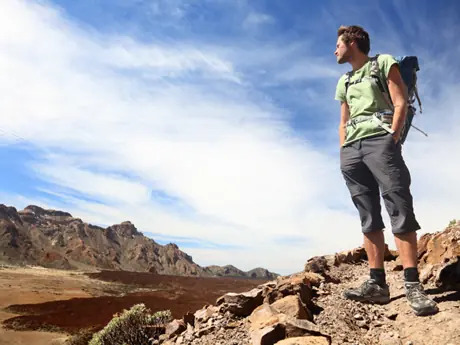 Before you head out for your hike, take a look at this hiking checklist to make sure you have all the right tools for the trail. Throughout the season, refine your own hiking checklist and store it in your gear bin so it's the first thing you pull out of storage each spring. Water is the single most important item for any outdoor excursion. According to NPS.gov, hikers going to the Grand Canyon should have 4 liters of water per person, per day. The reality is that you should always bring a little more than you think you'll need. If you're heading out on a long hike, and water sources are available, bring a filter to help refill your supply, or to use as a backup. Think about combining your water intake with sports drink to help replace electrolytes and salt lost through sweat. Having a flavored drink to sip on also makes it a little easier to stay hydrated. This is another category where you should bring more than you need, and bring a variety. Small snacks go a long way to keeping your energy up on the trail, and more calorie-dense foods are good for lunchtime. Tip: Pack your food in a grocery bag so that you have a place to put your garbage during the hike out.